Located in the modern Diagonal Mar district of Barcelona, Attica 21 is only 300 metres from the beach. The hotel has a rooftop swimming pool and free Wi-Fi. 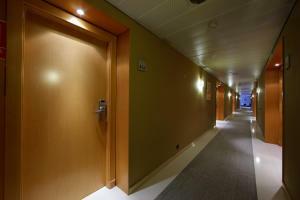 The contemporary rooms in Attica 21 Barcelona Mar all have wooden floors and large windows. They include air conditioning and a private bathroom. Attica 21’s rooftop pool is surrounded by a sun terrace and loungers, with stunning views of the city. In the summer there is also a pool bar. The hotel also offers a coffee bar and tour desk. The nearest Metro station is Selva de Mar, about 400 metres away. The Fòrum entertainment venue is 15 minutes’ walk away, while the Diagonal Mar Shopping Centre is 5 minutes away. Private parking is available on site at an extra cost. Please note that for group reservations of 4 rooms or more, different policies and conditions may apply. Please consult directly with the property in each case. 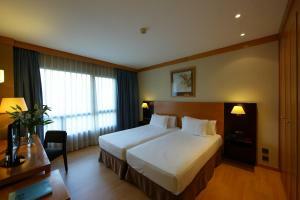 Air-conditioned room with cable TV, safe and minibar. The private bathroom comes with a hairdryer and toiletries. Rate: € 58.65 ... € 260.25; select dates below to get current rates. This room has two interconnecting double or twin rooms. There are two bathrooms. 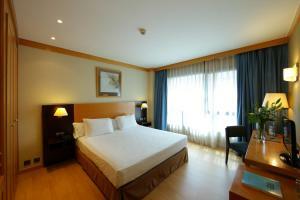 This stylish, air-conditioned room features free Wi-Fi, flat-screen satellite TV and an iPod docking station. The private bathroom includes a hairdryer, bathrobe and slippers. The room also comes with a coffee machine, as well as free parking. This triple room features a minibar, satellite TV and air conditioning.